Starring: Hugh Grant, Martin Freeman, David Tennant, Imelda Staunton, Jeremy Piven, Anton Yelchin, Brendan Gleeson, Ashley Jensen, Salma Hayek, Lenny Henry, Brian Blessed and more. 1) Voice Acting - Total Thumbs Up: I couldn't believe all the awesome names that scrolled on the screen for this film. Put them together with the great skills of Aardman and Sony Animation and all the characters felt very real. As tends to happen in animated films though, there's normally a non-speaking character that will steal the show. For me, it was Mister Bobo. He was the straight man in this great comedy of errors. Added an extra level of fun to the film. 2) Artwork/Animation - Total Thumbs Up: I was quite surprised at the utter beauty of several scenes. With a comedy like this one, you don't normally expect that extra push, but they did it and it was gorgeous. Close to the start there's a scene of the ship on the open seas which was utterly breathtaking. Everything was open to comedy and they took advantage of in every way possible. The adults should pay close attention to all signs and store fronts - filled with jokes left and right. 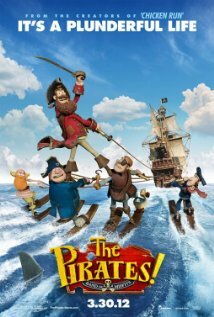 Many movies have previously drawn planes or ships on a map and shown them moving; Aardman Animation took this to the next level. Not only do they show the ship on the map, but it interacts with it and whatever is drawn upon it. It's made even more amusing when you see the crew actually throwing out orange floaters to create the trail on the map. The 3D aspect was not overused and did enhance the feel of the film for some very nice effects on occasion. 3) Plot/Story - Thumbs Up: Plot was the weakest of the sections, but was still fun and worthwhile. While the overall outcome of the story is never in doubt, it was quite pleasant when they threw in an unexpected surprise or two. Conclusion: Fun family film with lots of little bits for the adults to discover.